Earthquake and flood references are common in native oral traditions all along the Cascadia margin from Yurok territory in northern California to Kwakwaka'wakw territory at the northern end of Vancouver Island. Some native stories are literal, and clearly refer to recent historical happenings. Other stories refer to the effects of earthquake or tsunami metaphorically. 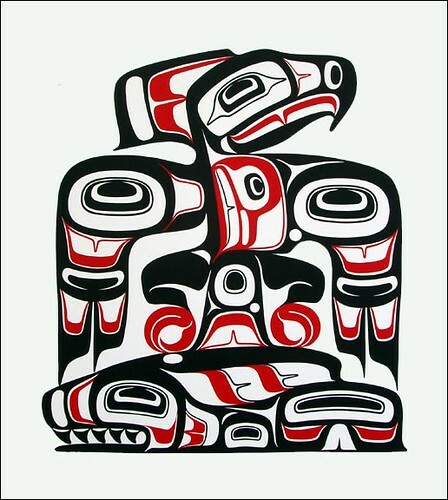 The Pacific Northwest traditions speak of shaking and flooding from the sea by referring to a struggle between the Thunderbird and the Whale. The Thunderbird and Whale in the Native American stories are creatures of supernatural size and power. Although native myths vary between tribes, the acts and personalities of these supernatural beings in the stories generally describe the effects of earthquake and/or tsunami. Thunderbirds are usually said to bring storms and rain in the native stories. They create thunder by flapping their wings and shoot lightning bolts out of their eyes. To the Pacific Northwest Indian, the Thunderbird is the most powerful of all spirits. The thunderbird is a regular fixture on top of totem poles of native tribes in the Northwest. Many stories from western Vancouver Island and northern Washington speak of a struggle or battle between Thunderbird and Whale, and throughout Cascadia stories about these figures frequently include explicit mention or visual imagery suggesting earth shaking and/or tsunamilike effects.